A soapstone group of a landscape in layers of rugged mountains. The front depicts three elders and two young attendants standing by the entrance of a meandering path, which is shaded by lofty pine trees and rocky mountains. The elder on the left in the group has his left hand half-raised and points in the direction they are heading. The group has crossed a footbridge positioned on top of a wavy river at the lower right corner. A tiny hunchbacked elder walking towards footsteps among the pine trees is carved in the lower left hand corner. Along the meandering path small houses occupy both high and low mountaintops. The path leads to the back of the landscape, where a small pavilion is situated alongside a cliff, shaded by a pine tree. The soapstone is overall of mustard-yellow colour, with some creamy-ochre and red inclusions, which can be observed especially on the base. Two seals in red carved on the front read Dunfu and Chenpin. On the back, a five-character inscription on the lower right reads Ni Songren Biyi (‘imitating the style of Song dynasty literati’). A two-lined, six-character inscription above the house reads Qianlong Bingwu, Xidaoren Zuo (Bingwu year of Qianlong reign, made by Xidaoren). 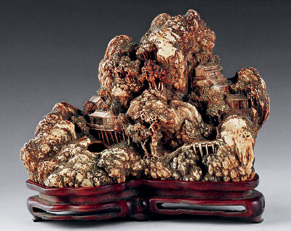 A fitted hardwood base is carved in openwork with pine trees, waves, and ruyi fungus among rocks. This minutely carved landscape group serves as a three-dimensional painting and miniature landscape, allowing a scholar to wander in an idealised rustic setting without leaving his studio. Such microcosmic landscapes were essentially retreats from the dusty world, one into which the scholar could project himself. 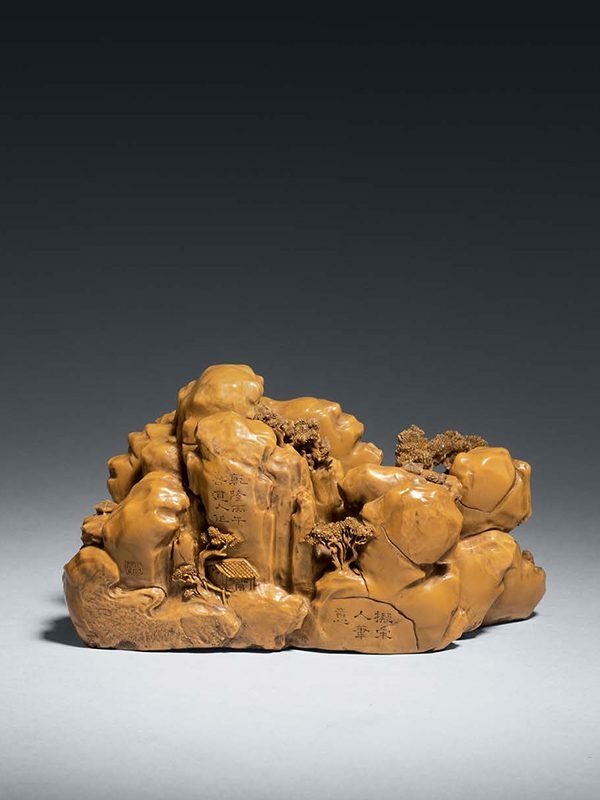 Many miniature landscapes were made in the late Ming and Qing dynasties, mostly in jade (usually referred to as ‘boulder carvings’), but also in bamboo, wood and other materials. Soapstone, known in Chinese as hua shi meaning literally ‘slippery stone’, is among the softest of all stones at only one on the Mohs’ scale of hardness, a quality which makes it particularly suitable to small scale sculpture. It is also known as shoushan shi, as it was mainly produced in Shoushan town in Fujian province. 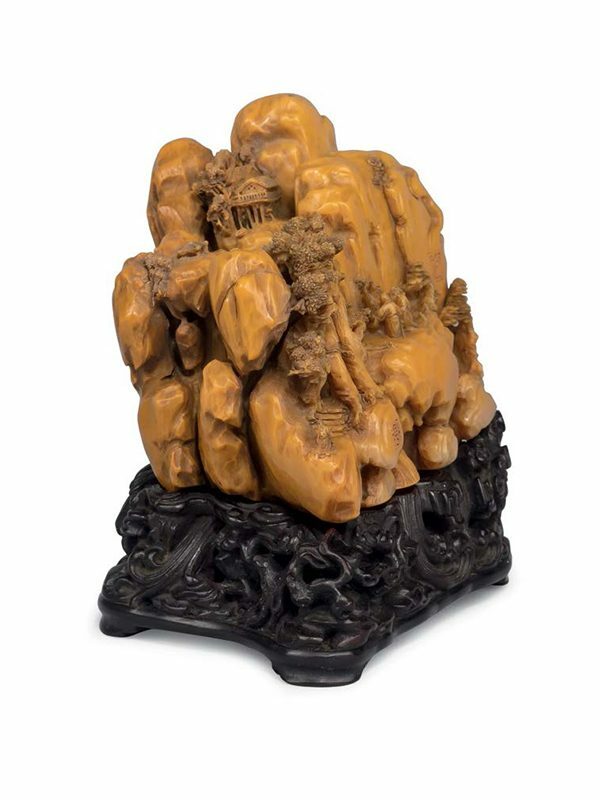 There are only a few known soapstone landscape groups of this distinctly literati flavour, transforming literati landscape painting into three-dimensional sculpture, that are dated to the Qing dynasty. The most famous artist in soapstone with a comparable carving style was Wang Zhu, whose creations are dated to the late Ming to early Qing dynasty. The works of Wang Zhu, perhaps an assumed name of an artist whose true identity remains unknown, are very rare today. According to Arts from the Scholar’s Studio, “it would not be unreasonable to guess that Wang Zhu is the art name of a late Ming scholar or artist who turned his hand to soapstone carving from time to time.”  A slightly larger multi-colour soapstone landscape by Wang Zhu, dated to the Qing dynasty and comparable in the combination of high-relief and openwork carving and layered mountain arrangement, is in the collection of the Tianjin Museum (fig. 1). 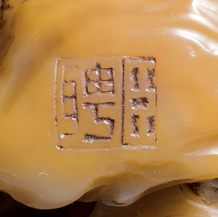 Another slightly smaller soapstone group in dark brown and beige colour, dated to the late Ming dynasty and inscribed with Wang Zhu’s mark, was exhibited at the Fung Ping Shan Museum, University of Hong Kong in 1986. In the collection of the Metropolitan Museum Art in New York, a large soapstone landscape by an unknown artist, depicting the nine elders of Mount Xiang has a comparable earthy ochre colour tone but has only low-relief carving. 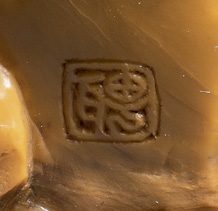 The seals and the inscriptions carved on the stone indicate that the maker may be Luo Pin or his follower. 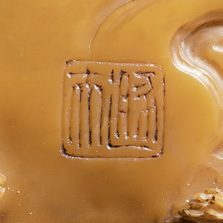 One of the inscriptions Qianlong Bingwu, meaning ‘Bingwu year of Qianlong reign,’ corresponds to 1786. A native of Yangzhou, Luo Pin (1733 – 1799) had the courtesy name Dunfu and one of his art names was Xidaoren. He was one of the famous late Qing dynasty scholar-painters known as the “Eight Eccentrics of Yangzhou (Yangzhou baguai)“ or “Yangzhou School”. These artists share certain common characteristics in life and art, and their painting styles were diametrically opposed to that of the so-called “Orthodox School.”  Luo Pin practised as a versatile painter throughout his life, equally proficient in figures, landscapes and flowers, and was good at seal carving as well. He was also technically accomplished and his style was marked by simplicity and strength. 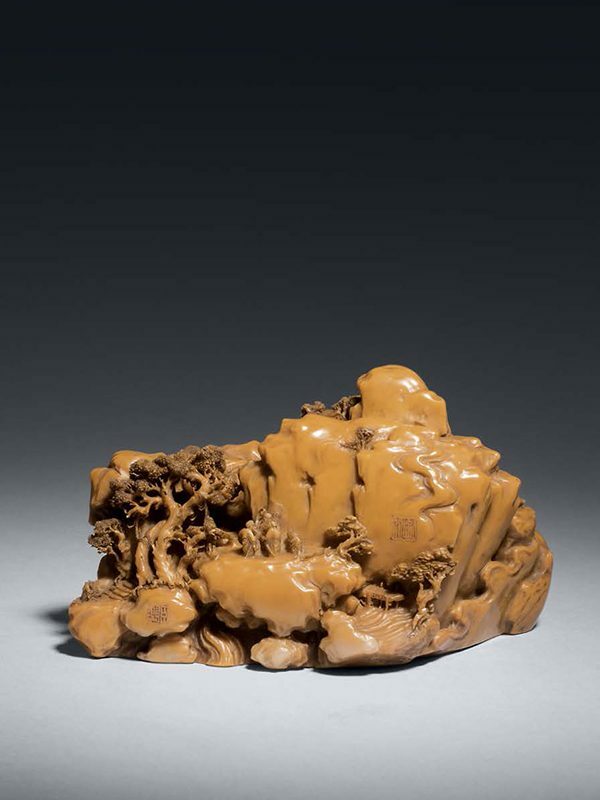 In one of his masterpieces, entitled Mountain Pass in Sichuan, which is now in the collection of the Palace Museum, Beijing, the rugged mountains and small scale of people walking along a pass are comparable to the present miniature landscape sculpture.